My kids love salad. Before you start rolling your eyes... let me give you my recipe for a SIMPLE salad dressing that makes us ALL want more. My girls (ages 4, 6, 8, and 10) DO literally fight over what's left in the salad bowl each night. I have had many friends lately, tell me that their kids won't touch greens. I believe that this is possible to change! In full disclosure, my girls have been fed green vegetables from the time they were babies. We also don't give them the option to say 'I don't like it" and pass on the veg. Over time, I've learned which things they truly don't like (Emma would rather not have raw bell peppers, Bella does not enjoy eggplant) but they still have to eat it if it's served. I am aware of the things that they don't love - so I will limit the amount I put on their plates - but I try to make the salad or veg to fill HALF of their plate. The research shows that phytonutrients in (especially raw) vegetables (and even more especially - dark, leafy greens) are a nutritional powerhouse. They protect our bodies with their incredible vitamins & minerals, help to prevent heart disease & diabetes, as well as boost the immune system (= less sick kiddos). Next... fresh garlic. Now, pleeeeaaaase don't use the jar of pre-minced garlic, friends. It's just NOT the same. 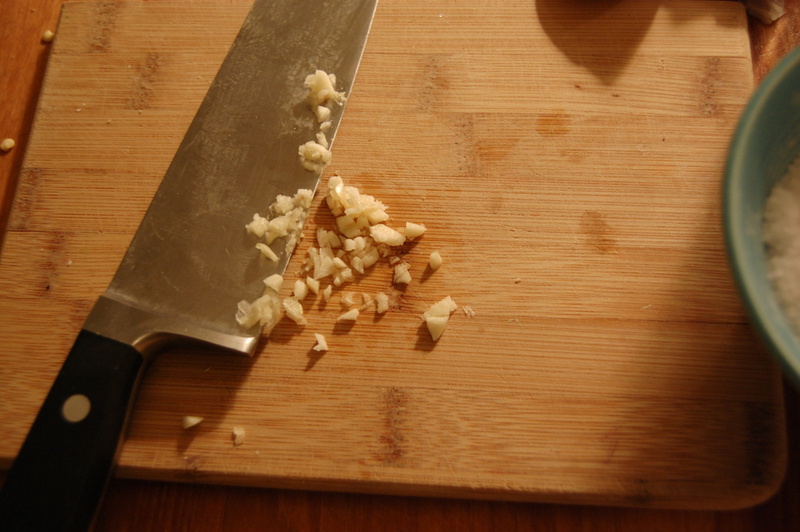 Once garlic is peeled and chopped, the flavor starts to get stronger and change. 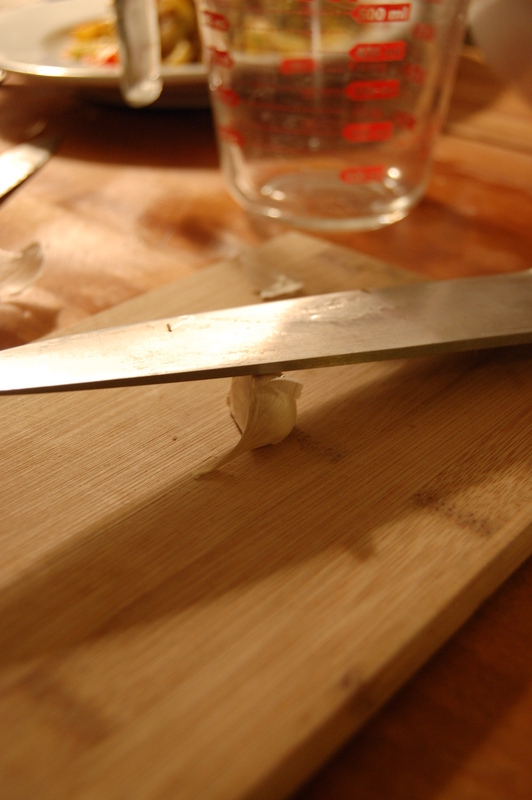 It only takes a minute to smash a whole clove of garlic (with the side of a knife), peel and chop. And... it's therapeutic. Chop that garlic nice and fine. (I used to use a garlic press for this, but chopping keeps the garlic tasting fresh - and doesn't overwhelm your dressing with way too much garlic flavor). You'll end up using more garlic this way (which is GOOD! Garlic is a huge immune-system booster). I usually only add half of a garlic clove. Now for the proportions. I'm an eye-baller. I am trying hard to keep track of measurements so I can share recipes... but all you have to do is watch the oil vs. acid ratio here. The fun part is that, once you get this part down - you can change things up all you want! Now (my secret)... add a little something sweet. Maybe this is why my kids fight over what's left in the bowl? It's SO good. I add about 1 teaspoon of agave or honey every time. If you've used a small jam jar (with a lid) just SHAKE. Or, mix with a whisk or fork until blended. You can also get a good blend with a hand-held blender. Make sure your salt gets dissolved and blended in - (you don't want the garlic and salt to sit at the bottom and get left out. Another VERY important tip: don't dress your salad until everyone is seated and ready to eat. Nobody likes soggy salad. Also ... just dress until coated. You don't want to drench it. Home made salad dressing is SO much healthier. You know what you are putting in your body - since you made it. There aren't any hidden chemical preservatives or scary High Fructose Corn Syrup lurking inside. The beautiful thing about adding this rich, healthy dressing - is that your body can absorb more of the vitamins and nutrients from the greens when they are paired with the oil (healthy fat) and acid. And.. it's delicious! Add 1 tsp. of dijon mustard and use honey as your sweetener. This honey mustard dressing is delicious on a chicken salad with cranberries. Use other ingredients as above. Use Rice Vinegar for your acid (not seasoned - that kind has added sugar - and you're adding your own natural sweetener), and add a few drops of toasted sesame oil. Use the other ingredients as above. This is a wonderful dressing for a Chinese Chicken Salad - use cabbage or romaine (or a blend) mixed together and toss in carrots, radishes, fresh cilantro topped with toasted sesame seeds and almonds or peanuts. Yum! So you see - you can change things up as much as you like! Try out some new and different vinegars - ( raspberry balsamic, tarragon white wine vinegar... the ideas are endless!) Hope to hear from some of you on what you've tried! !